uPVC double glazing is one of the best home improvements you can make if you want to reduce your energy bills and become more environmentally friendly. Replacing old, inefficient single paned windows with a double glazed unit will see you save hundreds of pounds every year. uPVC windows are a household favourite and the amount of installations surpass aluminium and hardwood for a number of reasons. You may have heard the term double glazing a lot down the years, but what exactly is it and how will it help you to reduce your heating bills. The technique is actually very simple and the basic structure is two panes of glass separated by an energy efficient gas spacer. This spacer, usually Argon, restricts heat loss with its motionless qualities. Heat is unable to pass between the two panes and exit the property. Combined with uPVC frames the efficiency of the unit is further heightened. Limit the amount of noise pollution that’s allowed into your home. In the same way heat is retained in the home, sound waves aren’t allowed to pass through the efficient uPVC double glazing. 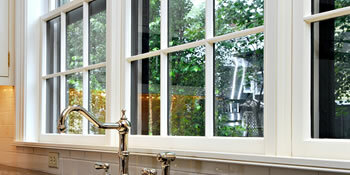 uPVC beats its main competitors of aluminium and hardwood in a number of key areas. The price is the first major advantage, being far cheaper than both of the above mentioned. And despite this, it doesn’t skimp on quality. uPVC is a durable, hard-wearing and weather resistant product and fitted with stabilisers, is resistant to the sun’s UV rays. On top of this, you won’t need to carry out heavy maintenance work and uPVC can’t rot, warp or bow. If you’re looking for a product that is proven to be a quality window material, uPVC is your answer. If you’re interested in uPVC windows it’s best to receive a number of quotes to compare prices and ensure you get the best deal for your money. Homes are given an energy ranking dependent on exactly how efficient they are and ratings are displayed in the information beneath. This varies from A, the most energy efficient, to G, the least efficient. With a higher rating you're more likely to have less costly energy bills as more heat is going to be kept in your home. You are able to increase your home's efficiency with insulation including double glazing, loft lagging or wall cavity insulation. The information below indicates the different types of homes in Uk. By far the most commonplace houses across the UK are detached and semi-detached properties. Various other properties encompass terraced houses, flats, converted flats and bungalows. The pie chart below displays the proportion of houses within Uk which are central heated and non-central heated. Central heating figures within the majority of UK homes, such as those on the gas grid and houses heated by oil and electric. The data underneath displays the spread of homes heated by various fuels. Around the United Kingdom the most common by far and away are gas heated properties, followed by electricity and then oil. Biomass central heating boilers are also growing in popularity, heated by environment friendly products like wood pellets or agricultural waste.|Houses in the UK are heated by a variety of fuels, including gas, electricity, oil, solid fuel and LPG boilers. Each fuel has a varying cost associated with it so you may find yourself with less costly energy bills by switching the way your household is heated. Even solar thermal panels are being regarded as by many people in order to lower heating bills for the years to come.